This is a collaborative post by Lizabeth (Betsy) A. Wilson, Vice Provost for Digital Initiatives and Dean of University Libraries; Denise Pan, Associate Dean for Collections & Content; Chelle Batchelor, Interim Associate Dean, Research and Learning Services; Director of Access Services; Tania P. Bardyn, Associate Dean & Director, Health Sciences Library; Corey Murata, Director, Collection Analysis & Strategy; Gordon J. Aamot, Director, Scholarly Communication & Publishing; and Elizabeth Bedford, Scholarly Publishing Outreach Librarian. 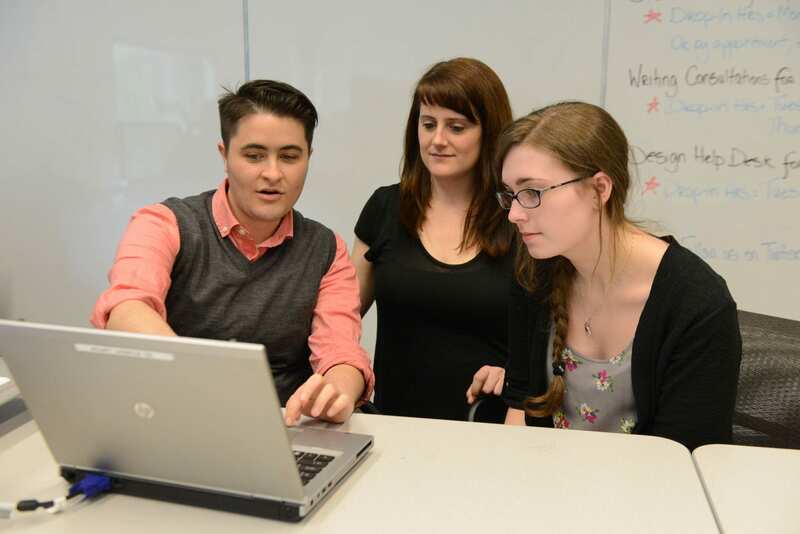 Librarian Reed Garber-Pearson (left) consults with UW students in the Research Commons. There is a disconnect in the scholarly publishing ecosystem between the creators of scholarship and the ownership and distribution of scholarship, especially with mega-publishers like Elsevier. Researchers publish their findings without the expectation of additional compensation in the interest of advancing human knowledge and building careers. Researchers also evaluate each other’s work for free by doing peer review. But the results of this scholarly output are almost always controlled by publishers and usually hidden behind paywalls. While the breakdown of the UC/Elsevier negotiation is big news, it is just the latest in a growing list of cancellations by our peer institutions of publisher “big deal” journal packages. In its Big Deal Cancellation Tracking list, the Scholarly Publishing and Academic Resources Coalition (SPARC) provides the names of institutions and the packages they have recently cut. These cancellations are a reflection of the widening gulf between for-profit publishers’ demands to continually increase package cost well beyond the rate of inflation, and the ongoing erosion of support for higher education. In her annual address to the University of Washington last fall, President Ana Mari Cauce highlighted the unsustainability of the funding model for higher education in our state. While UW Libraries has been fortunate to receive strong support from the faculty and University, we can see that gulf forming. With the Libraries in the implementation phase of our recently developed 2018-2021 Strategic Plan, it is valuable to step back and reflect on our values as we think about this changing landscape of scholarly communication and our future negotiations with publishers. Among these values are a focus on sustainability, equity and user-centeredness. Sustainability: While we are committed to providing collections and resources for our students, faculty and researchers, we are unwavering in the knowledge that we must be good stewards of allocated funding to support research and teaching at the University of Washington. In our negotiations with publishers, we continually balance researchers’ needs with fiscal responsibility. Working collaboratively with our campus community to build collections can accelerate scholarship and learning through responsive collections. Equity: We believe the current proprietary, closed, for-profit scholarly information ecosystem is broken, exclusionary and undermines the democratic ideals of liberal education. We view access to information as a social justice issue, and for-profit publishers’ unsustainable pricing models, demand for nondisclosure agreements and insistence on paywalls hinders the pursuit of knowledge, impedes our support of an informed citizenry and restricts research for the public good. User-centeredness: Our commitment to users remains at the forefront of our collections strategy and decision-making. We know that scholarship is a conversation — and that research progresses only when scholars have an understanding of what has come before and are able to share new knowledge. Because our library collections form the lifeblood of this conversation, we are keenly concerned with ensuring UW scholars have access to the materials they need to progress their research.